In this article, we take a look at some of the different uses of solar energy. You’ll learn about the common uses and discover some unique ways that people using this particular renewable energy source right around the globe. So let’s get stuck in and take a look at what solar energy is actually used for. A solar panel can capture the energy found within the suns rays and convert it into electricity. This is one of the most common ways in which we use solar energy and actually applies to many of the other uses that this article explains. The process of generating electricity from solar energy is known as photovoltaics (PV). During this process, a solar cell absorbs photons within the suns rays to create free electrons. These electrons are then able to pick up a current, thus generating electricity. People widely use solar power and it can be found everywhere from homes to office blocks. You can also use it to power portable devices (more on that later.) At an industrial level, power plants also exist that are able to produce solar electricity. Most people know that you can use solar energy to generate electricity. Fewer people know that they can use it to heat water. The process for solar water heating is often referred to as solar thermal energy (STE). Solar thermal energy technologies use sunlight to heat a fluid (and sometimes air.) This fluid (usually water) can then be used as part of a household’s hot water supply. Some people also use it to heat their swimming pools, helping to reduce their electric bill. Solar thermal technologies can also be used in industrial heating systems and commercial solar power systems. Homeowners often make use of solar energy to provide a source of outdoor lighting in their garden or front yard. This is a relatively low-cost solution to outdoor lighting and reduces the need to install electric cabling to outdoor areas. 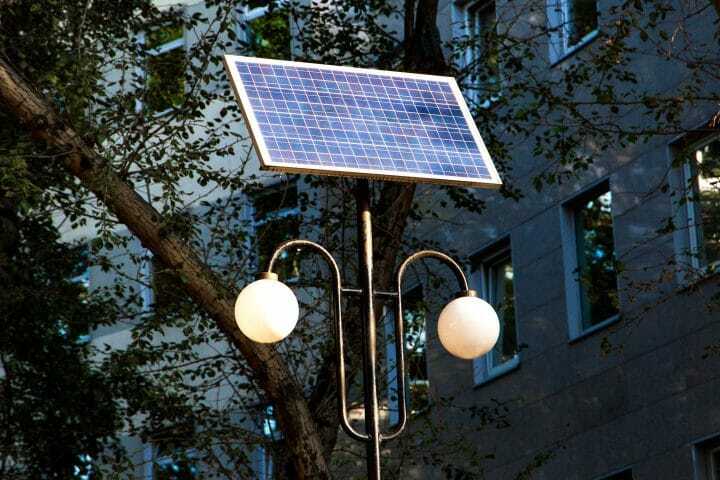 Town and city planners are increasingly making use of this solar technology to light public areas. Again, this is an ideal alterative to the installation of electric cables which can be very expensive to run in public areas, especially over long distances. Outdoor solar street lighting installed in a public area. Did you know that you can also use solar energy to cook a meal? Solar ovens and grills are becoming increasingly popular, especially in the camping world. They offer an easy to use and portable alternative to fossil-fuel-based cookers. 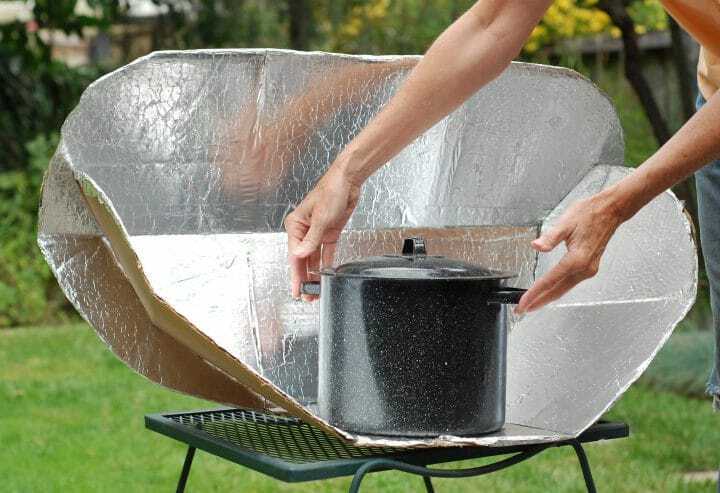 A portable solar cooker, ideal for campers. Road signs are increasingly making use of solar energy as their source of electricity. Most countries have implemented solar-powered road signs. A common use of such signage is for the monitoring and display of your speed in residential areas. Linked with road signs is the use of solar energy to power temporary traffic management systems such as the traffic lights at roadworks. Yes, solar energy even has its uses in transportation. Although most solar vehicles are only prototypes, we have seen several notable innovations in this field. The most famous of these is the Solar Impulse project which saw a solar-powered plane fly right around the world. Other solar transportation projects have received significant interest right around the world. Various cars have competed in the FIA Solar Cup which is entirely devoted to solar vehicles running in circuits, on the road, or a combination of both. Participants mainly involve universities and technical schools. This use is a more traditional take on solar energy consumption. Most of us have seen a greenhouse and experienced the heat it can contain. This is ideal for growing fruits and vegetables not native to your climate. Another noteworthy use of solar energy is with satellite technologies. 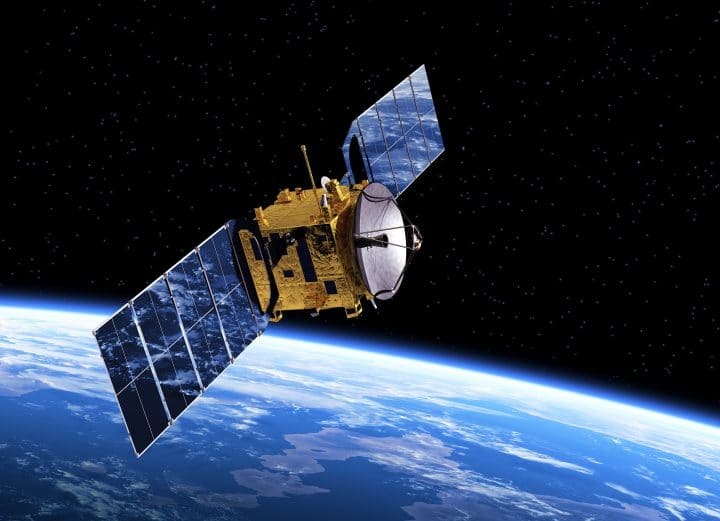 Although you’ve probably never come into close contact with a satellite, you’ll most likely have seen how a satellite has a large number of solar cells attached to it. These solar cells generate electricity to power onboard devices such as communication and guidance systems. Without the use of solar energy in space, satellites would be of little use and have a much shorter lifespan. A satellite using solar energy to generate electricity.